Aladdin is a child who has a magical flute with a djinn inside. 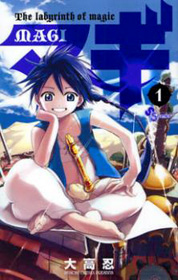 The djinn, named Ugo, is Aladdin's friend, has a huge muscular body, is headless, and is shy around girls. If they touch him, he becomes embarrassed. Soon Aladdin and is new friend Alibaba go on adventures together. What new things will they see and experience? Thanks go to Hyuga 91 for the summary. This follows the story of a boy who has returned to his family's home in the country after failing to make his dreams come true. He thinks his way through his predicament with the company of his pet turtle, Platon. More complications arise in the form of a neighborhood kid Sora, who has, for some reason, decided that he is God. Kawase Takashi has discovered that he will be learning about caring for animals from the legendary Haruo Minami. It's rumored that she's able to converse with animals, and they tend to all flock around her eagerly. However, she's also very unconventional and more than a little strange. For instance, she dreams of one day ruling a country full just of animals. Will Kawase be able to learn anything useful from such an odd teacher? Tsukihi is absolutely obsessed with an old mecha anime featuring the moon robot Gradolus. 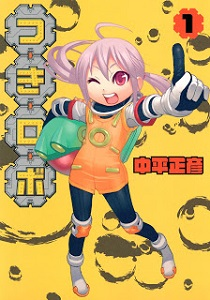 Her enthusiasm occasionally annoys her father and her friend Lune, who work with actual robots in different ways. Soon, however, she will find herself coming into more contact with the actual robots of the moon. Will she be able to see the mecha Gradolus in real life?! 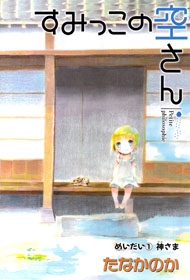 Sumikko seems like its going to be a very thoughtful, philosophical story, and I'd like to see where it goes from here. If you haven't done so already, check out the scanlations of the mangas from previous shout outs which have been recently scanlated: fantasy adventure Cloth Weaver (MH link), sci-fi slice of life one-shot Succeed (MH link). Tobidasu! 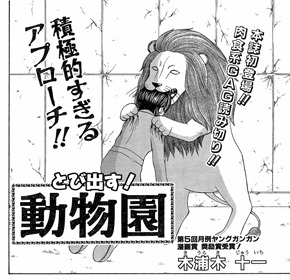 Doubutsuen is pretty good, I enjoyed reading the oneshot. Ah, sorry, my summary has a bit of ambiguity there... 'he' is the protagonist. The kid thinks the main character is god. Copyright (c) 2007-2017 by MangaHelpers. All rights reserved. All times are GMT . The time now is 08:08.